Lake Tahoe winter sports are one of the main reasons people visit the region between mid-November and April. 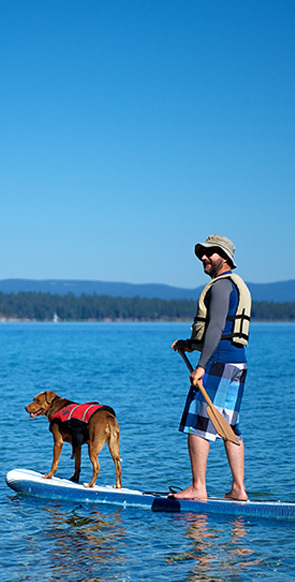 Tahoe is one of the west coast's most popular ski vacation areas. Snowfall in the surrounding mountains is the heaviest of any winter recreational area in the United States. Most winter visitors come for the downhill skiing and snowboarding, although cross country skiing and snowshoeing are growing in popularity. There are so many resorts nestled in the mountains around Lake Tahoe it's difficult to keep track of them all. Lake Tahoe winter resorts can best be grouped by geography. South Lake Tahoe Heavenly Ski Resort is practically within the city limits of South Lake Tahoe, sits atop Monument Peak in the Sierra Nevada Mountain Range, and is the most conveniently located resort on the southern rim of the lake. There are vast numbers of hotels and lodging nearby. A gondola whisks visitors directly from town to peak. Kirkwood is about 35 miles south of South Lake Tahoe on Carson Pass, and Sierra-At-Tahoe in Twin Bridges is just 18 miles southwest of the city. Oh, and incidentally, in South Lake Tahoe, if you want a hotel, you should know that you can easily walk from the 3 Peaks Resort and Beach Club to the lake, the mountains (via the Heavenly Gondola), and the casinos. North Lake Tahoe North Lake Tahoe, being much closer to Reno and its airport has a number of accessible resorts. Alpine Meadows, Boreal, Diamond Peak, Mt. Rose, Squaw Valley, and Tahoe Cross Country are well-known resorts in the North Lake Tahoe area. Truckee and Donner Summit In the general area of Truckee and Donner Summit there are Northstar-At-Tahoe, Royal Gorge (cross country), Soda Springs, Sugar Bowl, and Tahoe Donner. Sugar Bowl, being west of the Sierra Crest is a good choice if you want to easily beat the afternoon rush hour traffic. Weekend Crowding Most of these resorts have high speed lifts, plenty of lodging, and large crowds, especially on the weekends. But Alpine Meadows, Diamond Peak, and Mt. Rose on the northern side of the lake are less crowded. Sugar Bowl and Homewood near Donner Lake aren't as busy, and the crush of cattle both Sierra-At-Tahoe and Kirkwood is less of a problem. Resorts to the west of the Sierra Crest are the closest to the Bay Area and Sacramento, so skiers wanting to make a quick getaway in the afternoon to avoid the rush hour traffic are advised to consider these areas. Both Kirkwood and Sierra-At-Tahoe fall into this category. Skiing on the Flat How about some cross country skiing? Or snowshoeing? The best and cheapest places to work up a sweat are the many trails in the Tahoe National Forest. But, Royal Gorge and Tahoe Cross Country both cater to the "skinny ski" set. The Spooner Lake Cross Country Ski Area is just 12 miles from South Lake Tahoe and Stateline, NV. Whether you're into striding, diagonal stride, skating, telemarking, or snowshoeing, these resorts provide well groomed trails, warming huts, trailside cafes, and a host of amenities designed to take the edge off the rough sport of cross country skiing. Every Day's Tip: The flatter the terrain, and the slower the chair lifts, the cheaper the "lift" tickets.